Imbros Gorge, close to Chora Sfakia and Frangokastello, is the second most popular gorge on Crete after Samaria. During the high season hundreds of walkers visit daily to make the trek through the valley. The walk is not particularly strenuous and can be completed in 2-3 hours. The scenery is beautiful and the relative easiness of the hike makes it an ideal walk for families with children. The walk begins at the small village of Imbros, 700m above sea level. If you take the walk in spring or autumn, warm clothes are recommended to combat the cooler weather. After a few hundred metres you reach the entrance to the gorge, where there is a small hut where you must pay the entrance fee (€2 in 2008). The first half hour of walking is downhill, with the gorge getting narrower along the way. After 75 minutes or so you’ll find yourself in the narrowest, most spectacular spot of the gorge. The walls of the gorge are less than 2m apart and tower 300m above; this area is signposted (see image below). Fifteen minutes more down the gorge is a pleasant resting place. Some travel books say drinks are sold here, but don’t rely on this information - Last time I visited was in July 2008 there were no vendors here and not even a water tap. So be sure to take enough water with you. On a hot day this should be no less than three litres per person. Another highlight of the gorge is the so-called ‘gate rock’, a further ten minutes walk on from the resting place. You can take some really nice photos here. Walking through the gate, the gorge widens out again and after one more hour you’ll find yourself at the end of the gorge, where two tavernas are waiting for thirsty, hungry walkers. 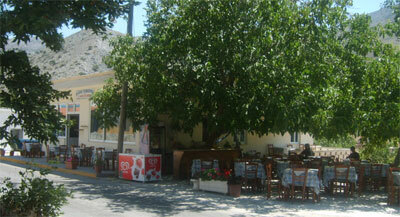 If you walk a little further you’ll arrive in the village of Komitades on the main road to Plakias. You can also go to Chora Sfakia which has plenty of restaurants and a small supermarket. The village of Imbros is a charming mountain village with some good tavernas, and home to the starting point of the eponymous gorge. You can reach it by taking the buses going between Chania and Chora Sfakia; there are three daily in the summer. The morning connections are usually packed with hikers. Komitades, situated at the end of the Imbros Gorge, used to be a quiet village, but has in latter years thrown itself into servicing the walkers of the gorge. This has led to a situation where rip-offs are quite a problem. Signs leading you to the bus stop instead direct you towards an expensive taverna. All of the ten or so restaurants here have high prices, and the quality of the food is certainly not good enough. It’s far better to walk on the main road (take the right turn) for ten minutes – you’ll find yourself in the centre of the old village of Komitades. 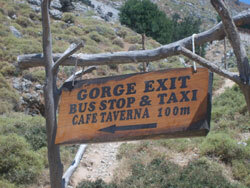 Most the tavernas here are cheaper and serve better quality food than the ones at the mouth of the gorge. Komitades is on the bus route between Plakias and Chora Sfakia. In summer 2008 there was a bus to Plakias around 5.40pm. If you want to go by bus to Chora Sfakia, Imbros (where many hikers leave their car) or Chania, you’ll need to walk 1.5km out of Komitades to the main road. Be sure to check the timetable first – there aren’t many buses. 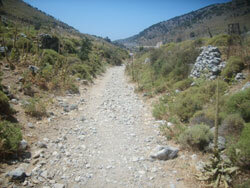 You could also walk from here to Chora Sfakia on the (busy!) main road. It’s only 4-5km, which most should make in an hour. There are also taxis from the end of the gorge and from the village of Komitades, but prices can be high – it’s best to haggle over the price and try and find fellow walkers to group up with. Almost all the major tourist resorts in Crete have tour operators offering day trips to Imbros gorge. The big advantage of these is that you get dropped off at the beginning and picked up at the end of the hike. Prices vary depending on the distance of your resort to Imbros, but most will charge €25-40. Warnings: Always take a lot of water. Imbros Gorge is one of the hottest places on Crete, and the river that flows through it in winter dries up completely in summer - there is nowhere to fill up your water bottle, whatever your books may tell you. Use good shoes. 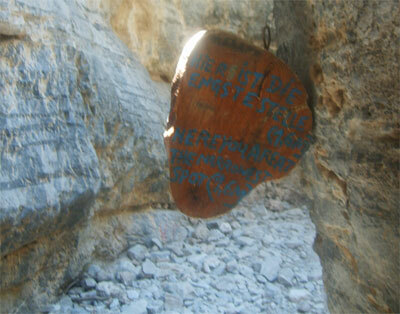 Imbros Gorge has many big stones - some as big as footballs – I slipped and fell twice in my trainers. 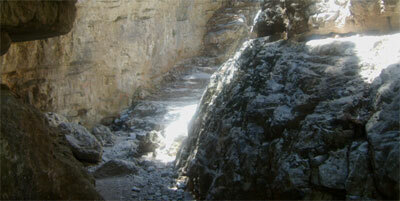 Imbros Gorge is open all year round, but I don’t recommend trying to do it in winter or spring, after the heavy rain. Landslides, tumbling rocks, big stones and lots of water make this a very challenging - not to mention dangerous – walk. If you are not sure, it’s better to ask the locals in the village of Imbros (which sees snow in winter). Imbros Gorge has some fascinating flora; the higher areas at the beginning of the gorge has a forest (with oaks, fig trees, almond tress and cypresses), petering out to a few bushes at the very bottom. It’s possible to walk uphill rather than down, but it’s exhausting. On the other hand, you’ll end up in the very attractive village of Imbros with its good tavernas and kafenion, and the bus connections are much better here. Not far from the exit of the gorge is the small holiday village Frangokastello (nice beaches).